Voted MAKE magazine’s “easiest to use” and “most reliable” 3D printer. Get started immediately with the Cube's simple setup. Just plug it in and start printing in 16 vibrant colors of strong and recyclable ABS and compostable PLA. Voted MAKE magazine’s “easiest to use” and “most reliable” 3D printer. Get started immediately with the Cube's simple setup. Just plug it in and start printing in 16 vibrant colors of strong and recyclable ABS and compostable PLA. Maximum creation size up to 5.5 x 5.5 x 5.5 “ / 14 x 14 x 14 cm wide and 0.2 mm or 200 microns layer thickness. Single Jet Plastic Jet Printing (PJP) supports fully automated, easy to peel off. Single cartridge prints up to 14 midsized creations. 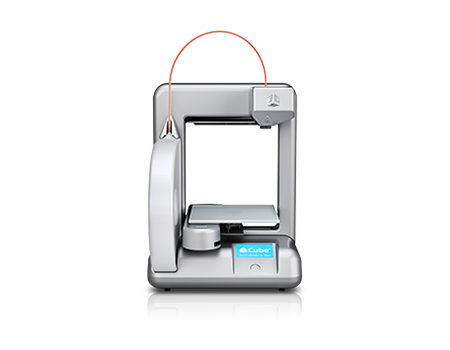 Comes with 25 free professionally designed 3D files and is Wi-Fi capable.